The day could not have been more perfect! We had been having wet, gray, cold weather all week but Friday it was 65°, the air was cool and crisp and the sky was a very bright blue. Amara’s excitement meter was at 9.85. For Christmas Grampy and I bought her an American Girl gift certificate. 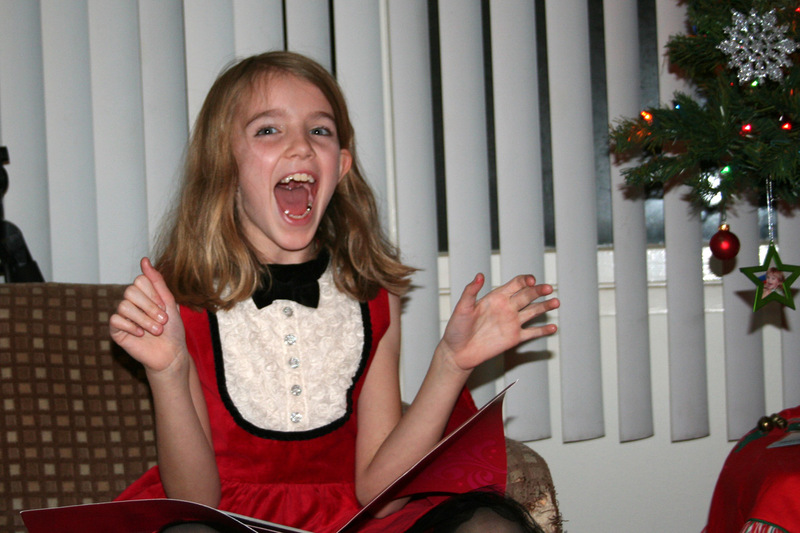 She was very excited when she opened it and even more excited when I made her take time to read the card. This present also included a trip TO the American Girl Store in Los Angeles AND lunch with me at the American Girl Café – a place she had never been. She had been to the AG Store once before when Mommy and Daddy took her to get Lily. 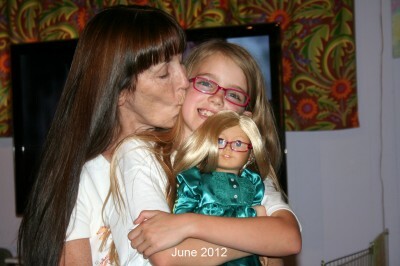 Lily is her “My American Girl Doll” and resembles Amara right down to the blond hair, blue eyes and glasses. 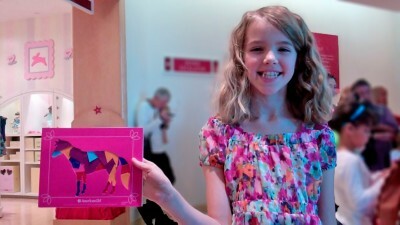 She was Amara’s birthday present from them when she turned eight. They made her new doll especially for her while they waited. Amara has been begging to go back to the AG Store ever since and she had never been to the Café. 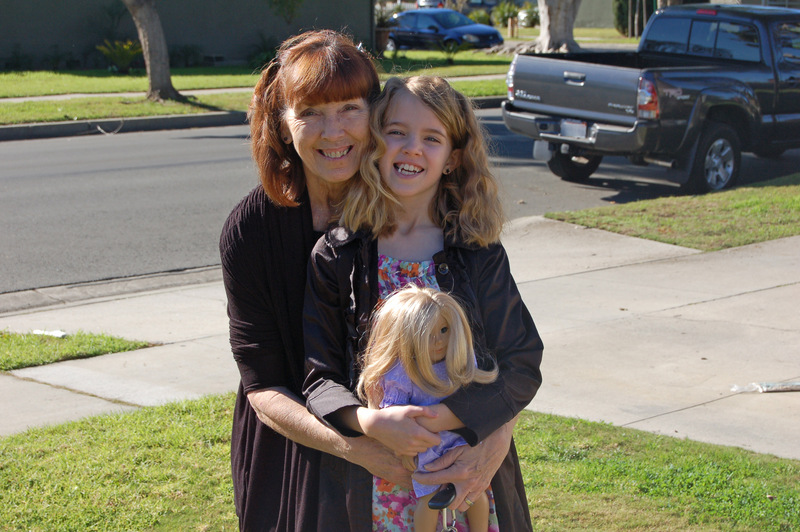 This year for Christmas, her parents had gotten her Saige, the new American Girl Doll of the Year for 2013. BUT you couldn’t get Saige until after her debut on January 1st. Amara is on winter break so I started trying to figure out when would be the best time for us to go – since you know she has been begging every day since Christmas Eve! She was resigned to the fact she would have to wait until after the 1st as the plan was to get Saige while we were there. Well, as it turned out they were having special events the first week of January in honor of Saige’s big debut. It was settled. We would go on Friday, January 4th! We planned to make it a very special occasion. We would dress up and curl our hair. Amara was planning to take Lily with us and was going to curl her hair, too. Jenna made us a “mix CD” and labeled it American Girl mix. I love my daughter! By the time we were ready to go Amara’s excitement meter had gone past 10. It was going to be the best day ever and it really was. The “holiday light” traffic as they called it made our trip a little easier but I had my usual directionally challenged moments coupled by Google Map errors. Jenna saved us on the phone and we got there in plenty of time. Walking into that store was just amazing. It was like walking into a wall of happy voices. It was loud but it was wonderful at the same time. Since Amara had been there before she showed me around the store. They had craft stations set up where the girls could make pictures of horses. Saige is a country girl and has a horse named Picasso. I guess she has also had some hot air balloon adventures as they made those too. They even had a photo booth setup where the girls could stand next to a cutout of Saige in her hot air balloon and have their picture taken. Amara is very much her Mommy’s child! She spent the last week going through her most recent copy of the AG catalog and looking at their store online. She had even cut and pasted the things she was interested in into a Paint document with notes about them! It became very apparent when we got there that she had the catalog memorized. There was the Grandfather who asked me what year they started making AG dolls? “Amara?” “2001.” There was the cute dress that was exactly like Saige’s. I pointed it out to Amara and she commented, “I think that dress is $54 Grandma. That is a lot of money.” I looked at the tag. It was $54. There was the cutest bathtub for the dolls on display. “It has twice as many bubbles now. They made it better.” She could get Lily’s ears pierced but “that would be $14.” She had that catalog down! We had so much fun. I just love that Amara is so social. 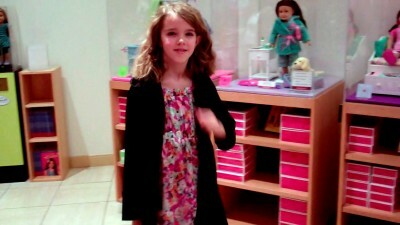 She chatted with other girls and grownups about her doll and about her Aunt Suzi that made so many of Lily’s clothes. She struck up conversations with the girls on both side of her when she went to the artist demonstration on how to draw horses and hot air balloons. She also made a new friend as we waited in line at the Café. She and her dolls were there with her uncle. I asked permission from her uncle to post this. It was his Christmas gift to her. I thought that was so wonderful that he wanted to give her something they could do together and share rather than just buying her a gift. He wanted it to be something she would remember as she grew up. We went and got Saige before heading to the Café. Amara wanted to have lunch with both of her dolls. 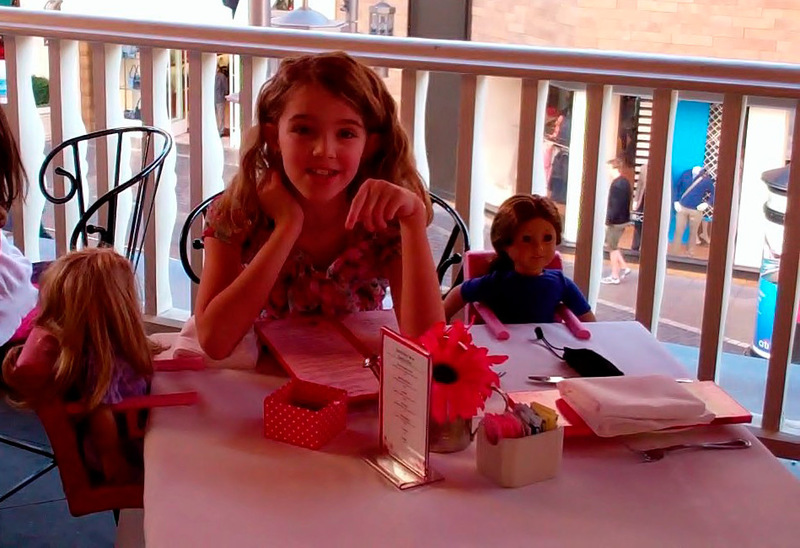 Lunch was a wonderful experience for Amara as they completely cater to little girls and their dolls. The place was beautiful, the service great, the food was wonderful but the best part of all was when Amara got up from the table and hugged me and told me thank you. I love being this child’s Grandma. 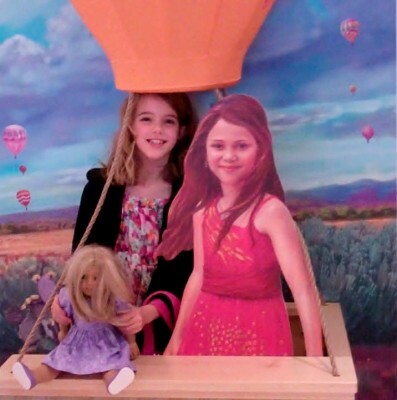 This memory was posted in Special Occasions and tagged Amara, American GIrl Store, Grandma, Lily, Saige on January 6, 2013 by Grandma Kc. Oh my, what a memorable day and such an extraordinary gift to give and also to receive as it unfolded! I am so happy for all of you. Family is the BEST! Wonderfully, Amara is so loved, and knows it well as are each of you! Thank you for sharing such a lovely day! An amazing adventure! The dolls came out when my daughters were just about ready to grow out of them. We have some of the early things and they were great even then. I love how everything about these dolls is not only wholesome, but educational as well. They promote the memorable experiences that you have enjoyed with Amara. I give you credit, too, for facing that LA traffic, even on a “light day!” You’re braver than I would ever be! Your last sentence says it all! We are starting to move a little past the American Girl Doll phase, and it is a sad state of affairs. Enjoy these times. What a treasure you have there…and it goes both ways. How nice to read about a young girl enjoying this “age and stage”. I think it’s so sad when you see girls Amara’s age being encouraged to dress and act like they’re teenagers. So inappropriate, not “cute” and what a shame that they’re missing out on being a young girl. What a glorious gift! 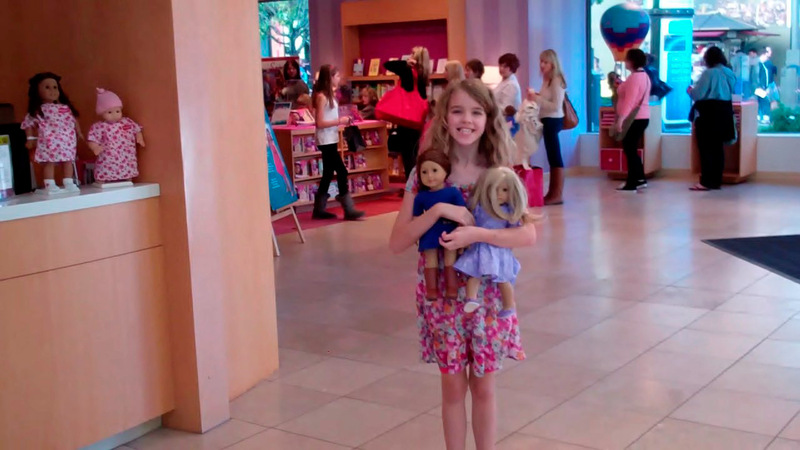 I knew American Girls dolls were a big deal, but didn’t realize how very wonderful just a visit to the store could be. Amara looks so very happy. (And I love the one with the two of you; your hair is so darn cute!) Thank you for another sweet glimpse into the life of a grandma to a grandDAUGHTER. That is a day she will remember forever! And so will you. Beautiful words to end your story. I wish I had one who loved dolls (as I had). Did I not read carefully enough? What did she buy with her gift certificate. What a big time. Love the price quotes! Oops! I left that part out! 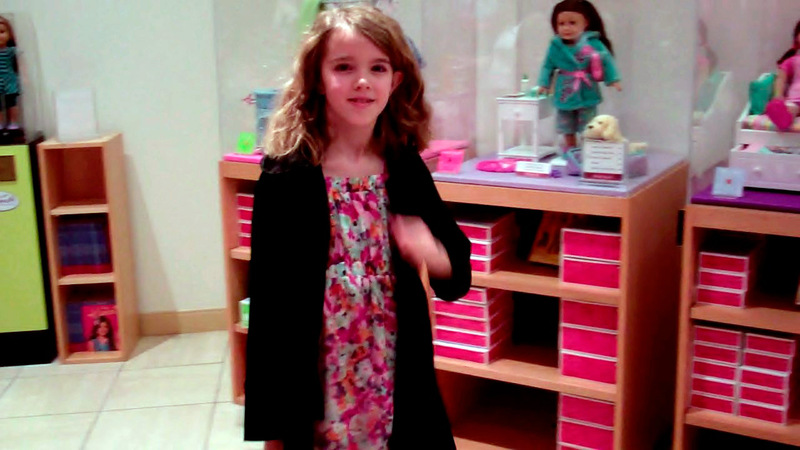 She bought Sam, Saige’s Border collie and one outfit – mostly for the cute cowboy boots that came with it! Aunt Suzi makes wonderful clothes but she can’t make a stuffed dog or gold cowboy boots!